NOTICE: Ciuffy will be answering questions related to my articles on my behalf as I am very busy. Hope You Have Fun !!! 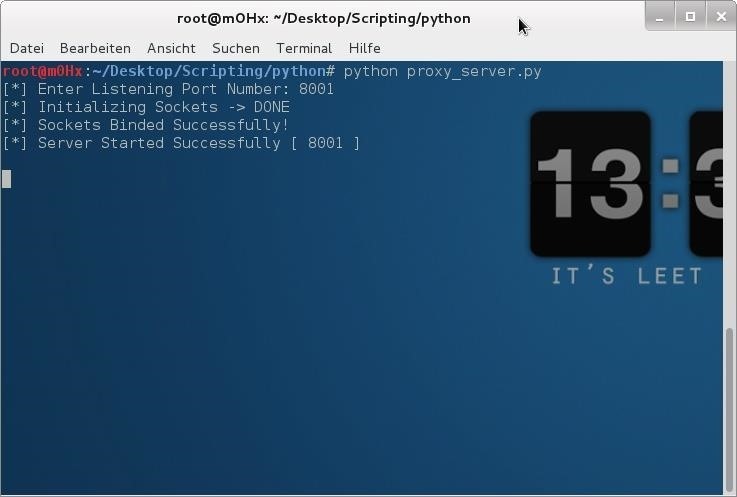 create a python script that serves as a proxy server ( Without External Libraries ). 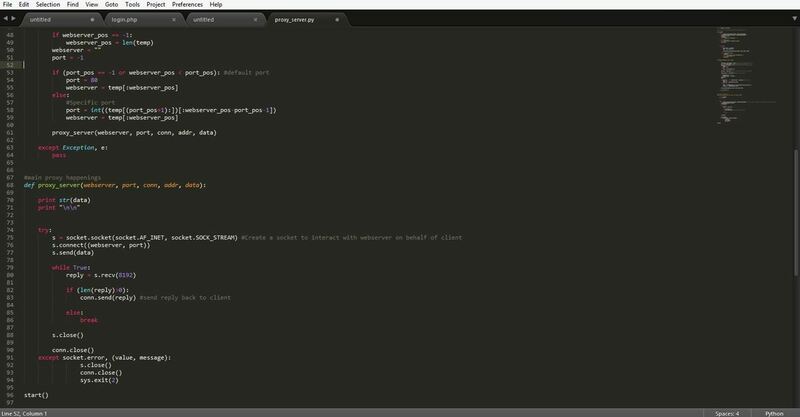 I made this script when I had some knowledge of python sockets and also thought it was a cool thing to do. I want to share it with the community. Before I begin, I would first like to thank the members who gave me positive feedbacks on my How To Make A Python Scanner Article, I am very grateful for your appreciation. somewhere but don't have a slightest idea of what it means. From WikiPedia - Proxy Server. evaluates the request as a way to simplify and control its complexity. content on the World Wide Web and providing anonymity. 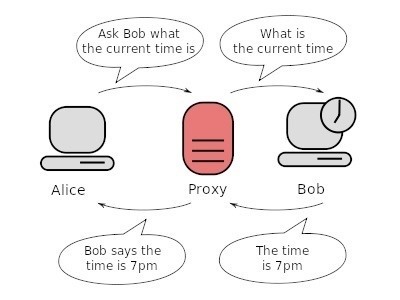 What Bob thinks is the server ( i.e the proxy ) asked for the current time, But what Bob didn't know was, Alice asked for the current time but through the proxy server. The proxy server returns the current time to Alice. So we can basically say, Server Bob has been tricked. The proxy server acts as a man in the middle serving two people without revealing their identities to each other, Each person sees only the proxy but not the other end. While a proxy might seem straightforward to the typical end user, there are many variations of the simple proxy website. While you might want only you chat with Facebook friends while at work and need to hop online anonymously through a proxy, what's happening behind the scenes can be quite complex. While many proxies look similar on the user's end, they can be very different to the developers and programmers. There are many types of proxies of which I won't be listing. Here are the most basic and commonly used ones. PHP Proxy – A PHP proxy uses a script written in PHP to take webpages from your regular server and then processes your search request to protect your main server. A PHP proxy can be a form of CGI proxy or simply a bit of code to attach to the URL as you type it in. PHP proxies can also be used by site and program developers to help cloak their original server to increase the effectiveness of web applications. CGI Proxy – A CGI proxy allows you to search through the proxy site for the URL you'd like to reach. CGI proxies allow you to search anonymously by hiding your IP address behind the proxy site. Thanks to this simplicity and anonymousness, CGI proxies are the most common proxies for the typical internet user searching for a means to unblock a website or search anonymously. HTTP Proxy – The HTTP proxy works with web browsers (HTTP clients) and servers that support HTTP. The HTTP proxy caches pages, or store them, for faster retrieval and are used occasionally to increase metadata services available on the website. Gateway Proxy – A proxy that allows requests and information to travel through without modification is called a gateway, or gateway proxy. These can also be called tunneling proxies as they "tunnel" around blocks put into systems through filters. Tunneling proxies are used frequently in workplaces and educational offices where there are frequent blocks on material that employees or students wish to access. Content Filter – The filter that might be blocking the sites you wish to access is likely a form of a proxy as well. These specialized proxies called content filters require all requests to pass through for review. The content filter proxy then blocks requests that match requests on a "black list" or based on certain security settings. Depending on the complexity of the content filter, network administrators can add to or remove items from the black list. DNS Proxy - A DNS proxy server takes DNS queries from a ( Usually local ) networks and forwards them to an Internet Domain Name Server. It may also cache DNS records. Anonymous HTTPS proxy - Users wanting to bypass web filtering, that want to prevent anyone from monitoring what they are doing, will typically search the internet for an open and anonymous HTTPS transparent proxy. They will then program their browser to proxy all requests through the web filter to this anonymous proxy. Those requests will be encrypted with https. The web filter cannot distinguish these transactions from, say, a legitimate access to a financial website. Thus, content filters are only effective against unsophisticated users. Use of HTTPS proxies are detectable even without examining the encrypted data, based simply on firewall monitoring of addresses for frequency of use and bandwidth usage. If a massive amount of data is being directed through an address that is within an ISP address range such as Comcast, it is likely a home-operated proxy server. Either the single address or the entire ISP address range is then blocked at the firewall to prevent further connections. Suffix proxy - A suffix proxy allows a user to access web content by appending the name of the proxy server to the URL of the requested content. Suffix proxy servers are easier to use than regular proxy servers but they do not offer high levels of anonymity and their primary use is for bypassing web filters. However, this is rarely used due to more advanced web filters. TOR Proxy - Tor ( The Onion Router) is a system intended to enable online anonymity. Tor client software routes Internet traffic through a worldwide volunteer network of servers in order to conceal a user's location or usage from someone conducting network surveillance or traffic analysis. Using Tor makes it more difficult to trace Internet activity, including "visits to Web sites, online posts, instant messages and other communication forms", back to the user. It is intended to protect users' personal freedom, privacy, and ability to conduct confidential business by keeping their internet activities from being monitored. I2P anonymous proxy - The I2P anonymous network ( I2P ) is a proxy network aiming at online anonymity. It implements garlic routing, which is an enhancement of Tor's onion routing. I2P is fully distributed and works by encrypting all communications in various layers and relaying them through a network of routers run by volunteers in various locations. By keeping the source of the information hidden, I2P offers censorship resistance. The goals of I2P are to protect users' personal freedom, privacy, and ability to conduct confidential business. Ok, I think that is enough for a brief introduction. The script is cross platform since the modules imported are cross-platform i.e available in both windows python and linux python. 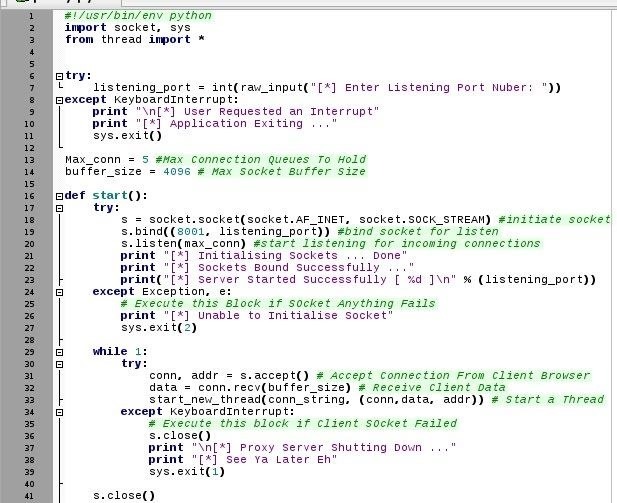 listening_port - We ask the user for a listening port using the raw_input function, After we assign the input to the listening_port variable. max_conn - We limit the amount of connections to our proxy server. This handles keyboard interrupts ( Ctrl + C ) should the user want to close the script for whatever purposes. 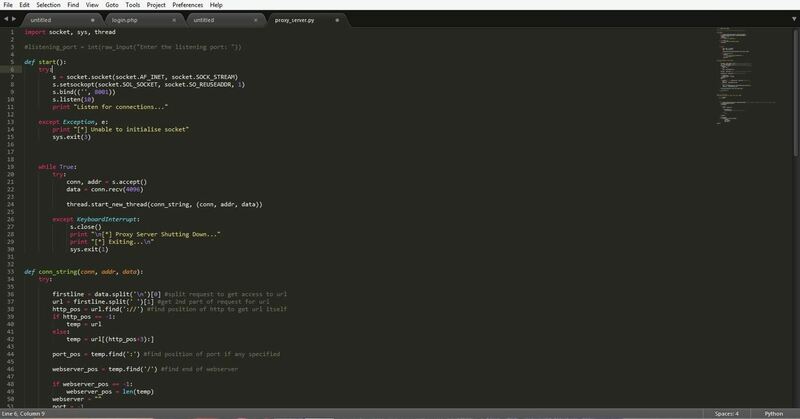 This prevents python from stopping our program execution and spilling its Keyboard Interrupt exception code to the screen. ( Kind-off seems unprofessional ). Like this ..
Let's see what our program does when a user hits the interrupt command. We are going to enclose all our codes in functions and later call them during our usage. We are going to use three functions in the script. 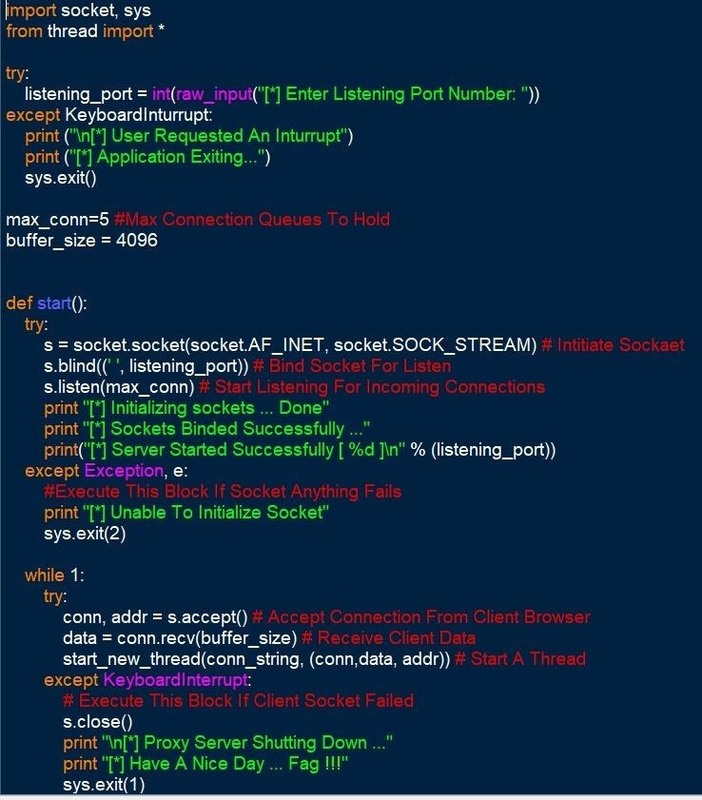 When a user interrupts the program, the server connection stream closes, prints the custom message and exits the proxy script. This is an example of a client browser request ( The connection is to Null Byte ). What this function conn_string basically does is to retrieve the host address, port (if specified by client) in the received client data, call another function proxy_server and pass five arguements to it. addr - address from connection stream. NOTE: An error I made. The s.connect function in the fourth line in the image below should have the variable webserver instead of host. Failure to change will deny the user of relaying the information to the internet. 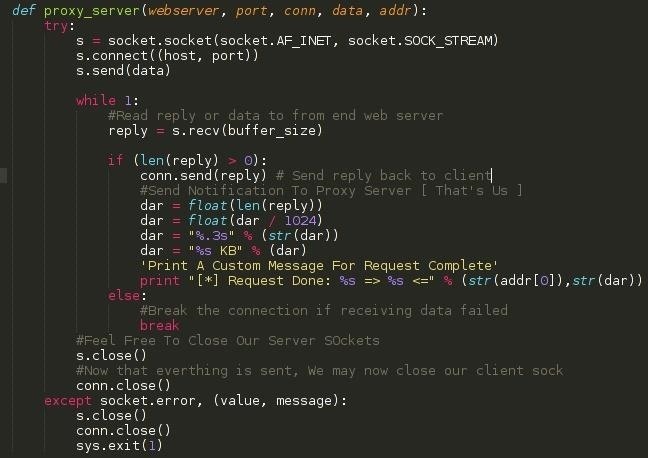 This function creates a new socket, connects to the webserver and sends the clients request, receives the reply, forwards it back to the client without modifying it, prints a custom success message and closes the streams. Let's make the magic work ... We simply type start() on a last line of the script. Ahh !! :) ......... Successfully working. I hope we had fun and learnt something today. This script can be hosted online ( maybe on a vps ) to serve as a proxy and receive requests from clients. 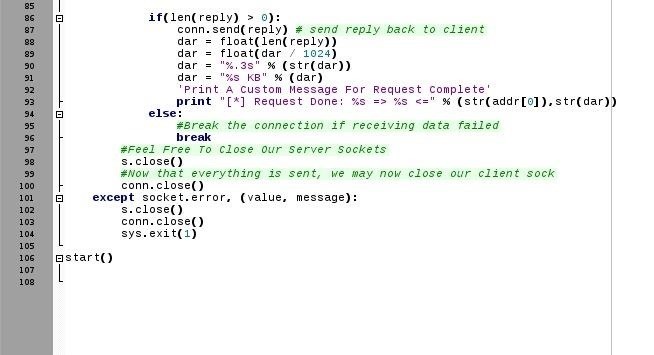 We can also make logs from the script right after sending the reply back to the client. Notify me of any errors, misinformation or anything that needs correction. Hope to see you soon and Have a nice day !!! Very fun guide, I always love when we create something rather than use something pre-existing. Who's sniping my comments again?! Anyway, I said what ghost_ said sounded like one of my other comments. I replied to your comment that it sounded like what I said on Ciuffy's post. "It's no fun using someone else's tool." My comment was deleted, however. I don't know why, but it's not the first time. My comments were sniped a lot a few months ago. Think the DB needs some love or somebody is in the back end because I'm not getting notices either. Your guides are really detailed, and I agree with ghost_. Unable to Initialize Socket - The only problem could be your port number, It may be in use. Just change it with a different port i.e number. I've tried numerous port#s, with the same result. ?? When I load my .py, I get this prior to run, not sure if it has anything to do with the issue. err.. is this typical? lol. I don't get the origin of the error output either. Please post your code i.e in 3 different screenshots. That way i can help. It seems like I am missing some 40 lines of code, as I mentioned earlier -- but aside from the 'get/host/user-agent' block, I can't see what I might be missing. When does the error occur, immediately after program start up or during an input or ... ? the script is running (server started etc.) but i don't receive any data. Iceweasel returns an "... proxy refused connection". Don't mind my line numbers, I had to space out the codes in order to have a full and clear screenshot. If you have any problem, You can output your error and also your code to see if anything was missed. 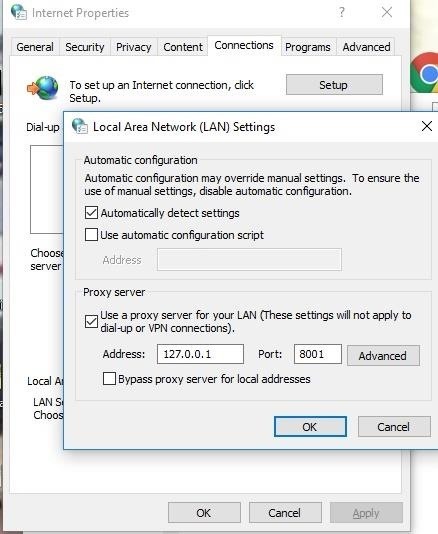 Proxy Refused Connection could be as a result of the server not started. Server Started but closing connection due to an error. Connection received but was not processed successfully. ## --- He may have comment notes in the script that would space it out as well. The peer is not listening on the port you specified. I rarely call for the screen but we are gonna need a screeners of the code and the output please. 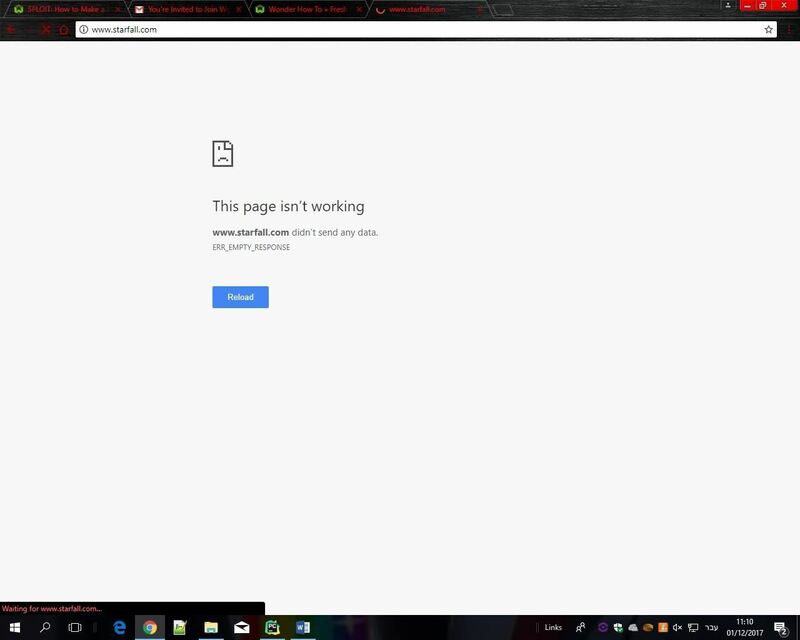 Do you only get this error when using a browser to bounce? i only used Iceweasel so far.. i ran the script, choose a port (screen), started iceweasel and set proxy conf (screen). but it seems that no data is going through... because connection was reset. Funny, Lolx, Take a look @ your second screenshot. And see my second screenshot. 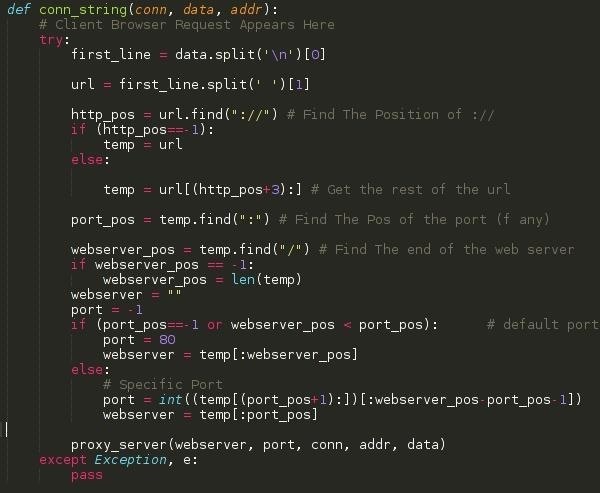 After temp = url(http_pos+3):, the rest of the codes are not under the else statement, That is why the script cannot retrieve the connection details as well as making a connection because we passed all errors so you couldn't see it. And it seems you messed the codes big time. 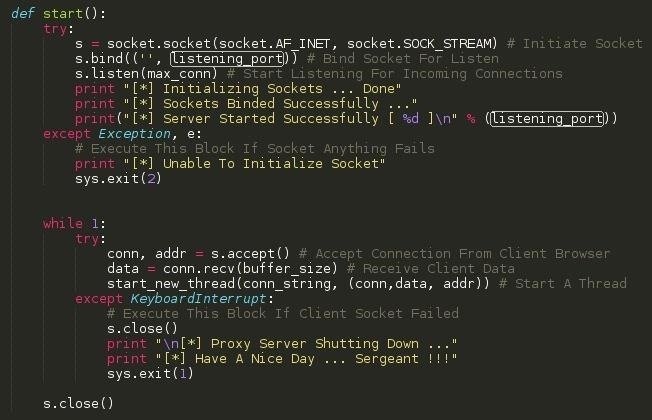 NOTICE: The First Screenshot: I closed the socket "s.close()" before exiting the script"sys.exit()"
I changed the code like you did in your second screenshot. what do you exactly mean with "And it seems you messed the codes big time." ? Watch my screenshot and compare if you missed anything or misplaced a code. 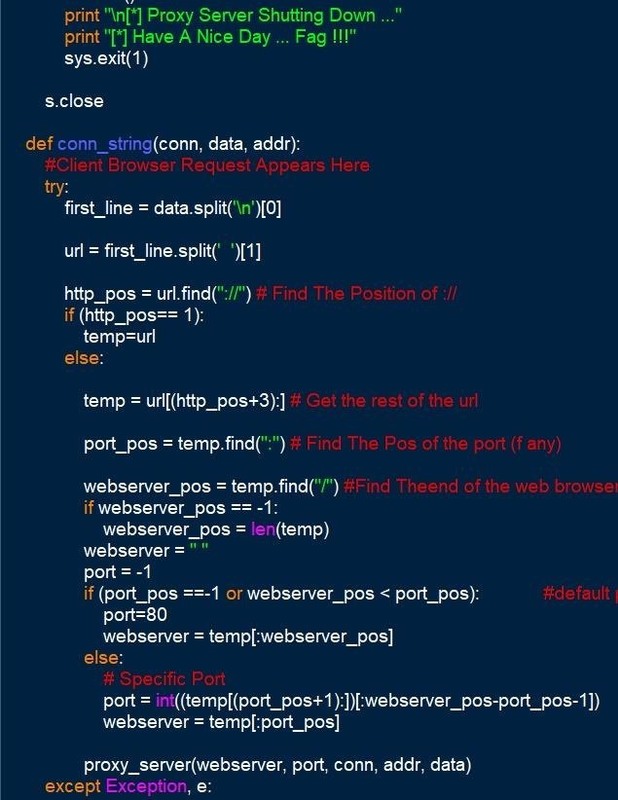 Might be more easy if you just start again from line 1 and rewrite it Exactly the way he has it coded. Your indentation is horrible to start off with, no disrespect. I checked your code and didn't find anything wrong, I also haven't come across your problem so what I recommend is to edit your script to print any error message. That should enable debug the problem. How to solve this 'Secure Connection Failed' error??? 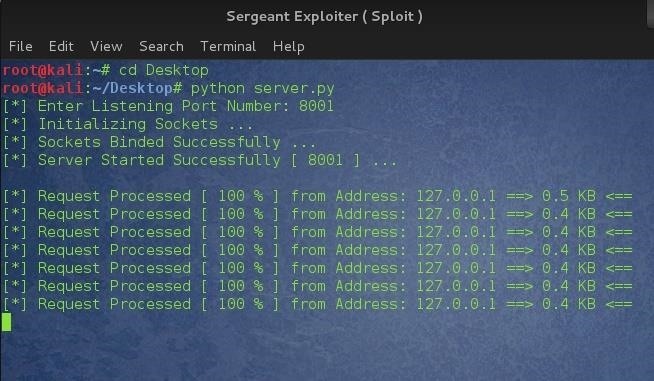 Hey Sergeant, I am having difficulties running my python server. In my browser, i get connection refused. ( I have been following your tutorials from facebook and I must say: "They are really impressive" ). Great tutorial by the way. Thanks a lot Sergeant. And I do understand thanks for the reply though. And @Adams I think you may either have used a different proxy port for the script and the browser or the proxy server isn't running as well. So i advise that you check to make sure the ports are the same in the script and the browser settings and also the proxy server is running. Post the code you are using on pastebin and show it to us. 1) Are you asking for a script that enables you to route all the traffic trough a proxy which was previously setup, or how to build the proxy itself? 2) What's the blackberry subscription about? Are you trying to setup a proxy for the whole LAN? the proxy enables the machine utilize the connections of the blackberry subscription. You may want to try the script in python explain in this tutorial and combine it with proxychains or Iptables redirect. 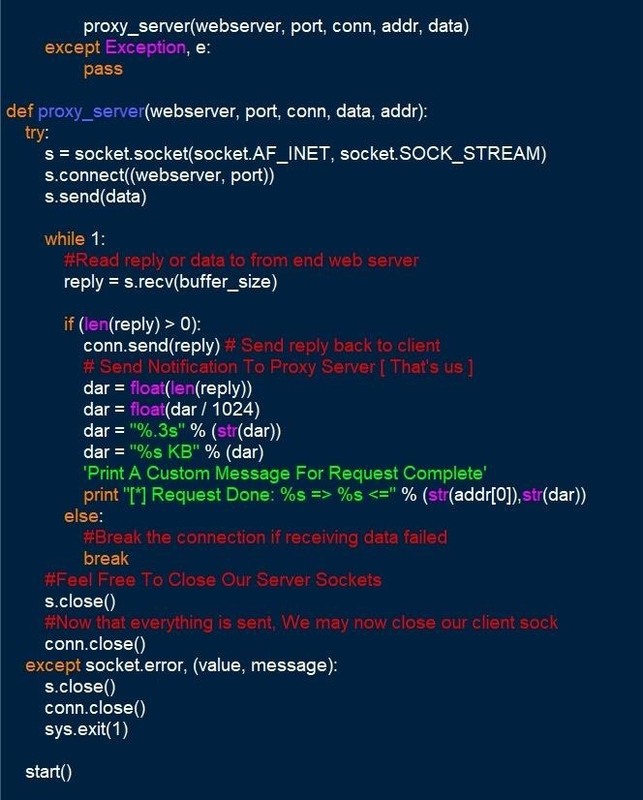 After you made the check, remember that the full data is passed to function proxy_server() around line 73 so you should operate a replace on the first bytes of data to get what you want. How could the if and else statements look like on this tut while trying to achieve what I said? I must have pushed the wrong reply button lol... I answered your question to the comment right above yours. Anyway, also look into twisted, it already has all you need for handling proxy connection, add / modify headers, ...lots of interesting things. very great tutorial and many thanks. It is working as expected but I have a quick ? If I wish to send another data request via the first port under start(), I can not see the data under def proxy server i.e. if ALice ask again what time it is? The only way I can make it happen is by creating a new socket from the perspective of Alice? It seems just stuck in while loop under proxy server. Just waiting for any data received from the other servers? Hope this makes sense. thanks for any feedback. 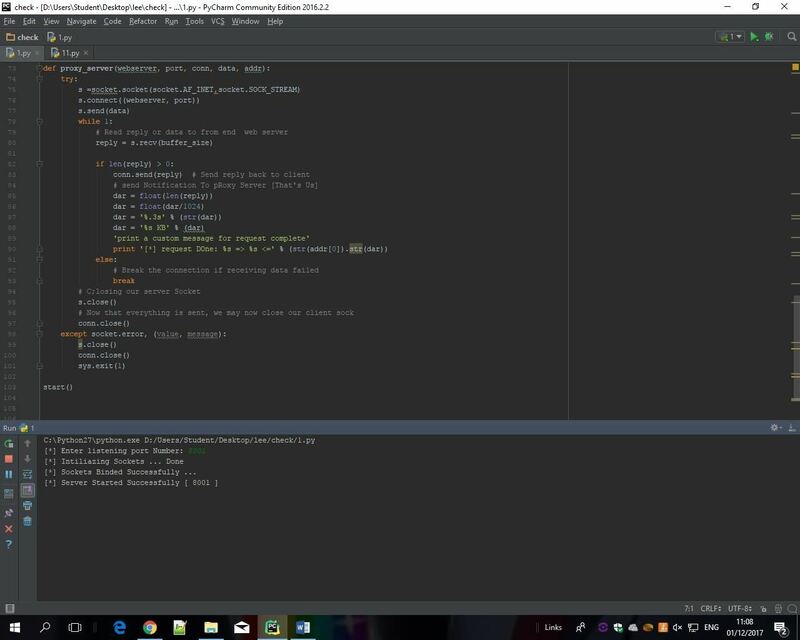 What do we have to type in python for the keyboard interrupt part? Thank you IMISSTHESHORE. I noticed it yesterday as I was trying out a project for my free week. I have reflected it in the text above that image. Hello Michael, I just run through your code ( actually I am not looking into it because I don't want to dive into any computer based stuff now ) and noticed an error like print(" Request Done: %s => %s <= %s" % (self._addr0, dar))_ on line 99. All what I would like you to do is to take your time and match references for the new modules you are using and also make sure you debug each stage of a function. The error on line 99: %s are 3 whilst the % ( the variable reference symbol ) is only addressing 2. Please do take your time and look through the code. Should the problem still persist, you can contact the administrator, I think he knows some python. Also you cannot modify HTTPS connections, only HTTP. Modifying HTTPS is possible but not possibly with this code. Hope you understand me. I noticed that in screenshot 5 the call to proxy server passes addr, data as the last two arguments. However in screenshot 6, the parameters of the proxy server function accept data FIRST followed by addr. Is that supposed to happen? Otherwise we proxy out the address, not request. Great tutorial but i still have some problems. 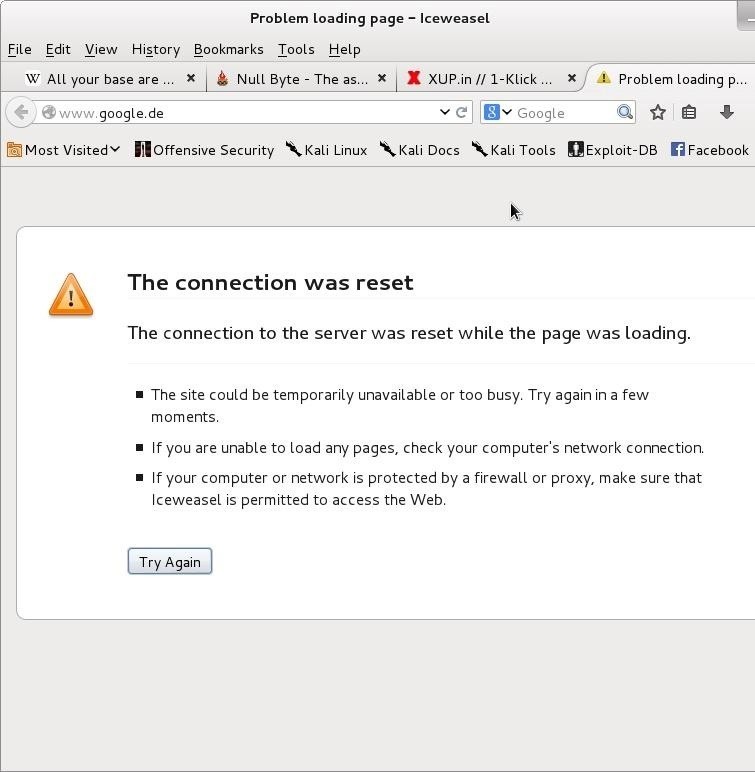 From the look of your error, it seems to originate from the server accepting client connection. Please do post a screenshot of that section of your code and let me have a look at it. 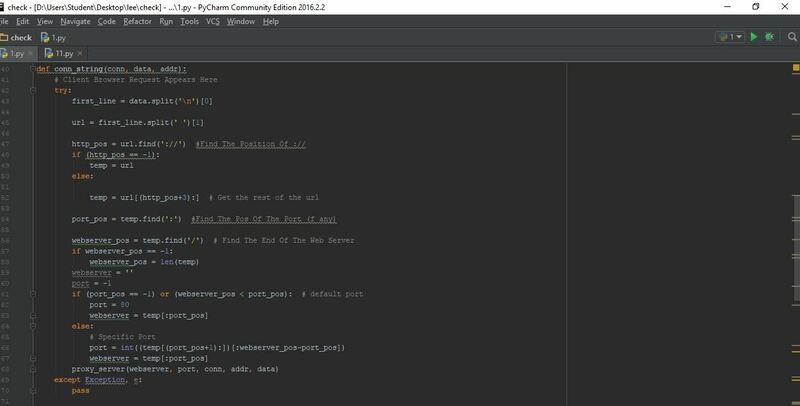 Can anyone post the whole working code in pastebin ? I would like to use it to build a proxy circumventing csrf protection and publish it (with creds to you) on github. Is this ok for you? This problem exists, because I don't resolve dns name? It may be that I have misunderstood your last suggestions about changing port settings - is this somethng I should do in my setting preferences (I have a Mac)? 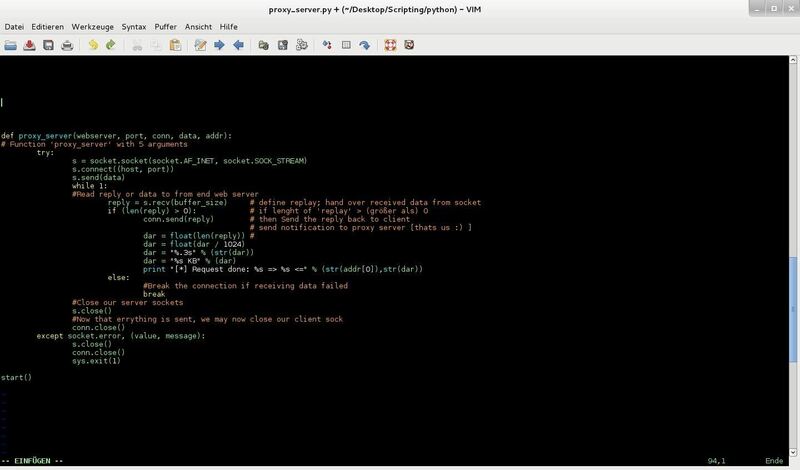 Can you please upload a tutorial on how to set this proxy_server .py script on a vps. _I got a couple of questions, can it be used on udp? And can it be used with ipv4 and ipv6?